LONDON--(BUSINESS WIRE)--The global amylase market is expected to post a CAGR of over 5% during the period 2018-2022, according to the latest market research report by Technavio. A key factor driving the growth of the global amylase market is the growing demand for processed foods. The growth of the processed food industry is attributable to the changing consumer behavior and the high demand for convenience foods and fast food. This, in turn, exerts a positive influence on the requirement for food enzymes that include amylase. Enzymes play a pivotal role in product lifecycles and ensure product safety. With consumers demanding more healthy, convenient and easy-to-use products, food manufacturers are increasingly using enzymes to tap into the growing processed food markets. This market research report on the global amylase market 2018-2022 also provides an analysis of the most important trends expected to impact the market outlook during the forecast period. Technavio classifies an emerging trend as a major factor that has the potential to significantly impact the market and contribute to its growth or decline. Protein engineering refers to the process of designing new enzymes or proteins with new functions by changing amino acid sequences, using the recombinant deoxyribonucleic acid (DNA) technology. Enzymes such as amylase are gaining popularity for the manufacturing of the products in various application industries owing to their effective catalytic properties. New developments in biotechnology and protein engineering provide a platform for the efficient development of enzymes with improved properties. Therefore, the development in protein engineering will fuel the growth of the global amylase market. “The production of alcoholic and non-alcoholic beverages requires enzymes such as amylase. Enzymes are used in wine-making processes to increase preliminary juice extraction and to obtain better-quality wine as amylase helps the hydrolyzes of starch. The development of advanced fruit juice processing techniques and the acceptance of packaged fruit juices will also open many growth prospects for the market,” says a senior analyst at Technavio for research on specialty chemicals. This market research report segments the global amylase market by end-user (food and beverages, animal feed, and laundry and detergent), and geographical regions (APAC, EMEA, and the Americas). The Americas led the market in 2017 with a market share of about 42%, followed by EMEA and APAC respectively. The Americas region is expected to continue dominating the market during the forecast period with the highest incremental growth. 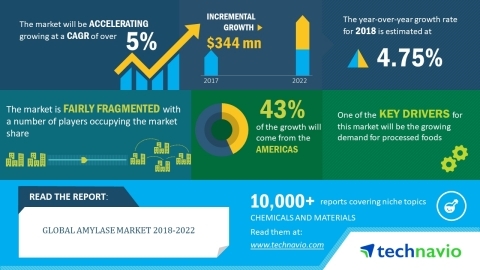 The global amylase market is expected to post a CAGR of over 5% during the period 2018-2022, according to the market research report by Technavio.